The champion's choice, the KS3 is THE wave sailor's choice. 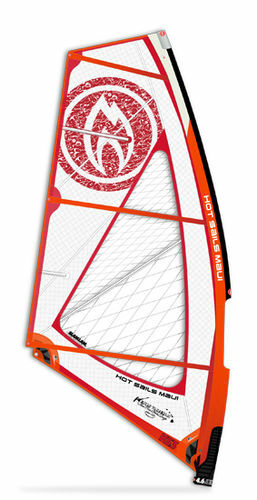 Two back to back PWA Maui Aloha Classic 1st place results by our rider Morgan Noireaux have put to rest any doubt that this 3 batten sail design was a "fad". The KS3 was created in 2013 by three-time world wave champion and 2nd place finisher at the 2015 PWA wave finals, Kauli Seadi and the Hot Sails Maui design team. Kauli, Tom, & Jeff have worked tirelessly to create a totally new experience in windsurfing. Powerful yet unbelievably stable the three batten design has radically less sail momentum which leads to faster response times and improved feel. The result for Kauli, Morgan and dozens of other top wave sailors is a more explosive wave ride and quicker action in the air. The result for the rest of us is an amazing new type of sail that seemingly does not get overpowered and maintains a locked in feel under all wind conditions. As you drop into a wave the forward pull of the KS3 drives your rail through the turn helping you stay tight in the pocket, the increased exit energy that this generates adds a new dimension to your riding, with more power and speed turns gauge deeper and throw more spray. New for 2016 is the addition of our lightweight OX Webbing sleeve that is nearly indestructible. Even a broken mast in the sail will not damage this new .095 mm thick amazing fabric.